On March 1, British Foreign Secretary Jeremy Hunt held a meeting with chief negotiator for Yemen’s Houthi Ansarullah movement, Mohammed Abdul-Salam, in the Omani capital of Muscat. Abdul-Salam basically told him that London cannot be a peace-broker in Yemen while it’s arming the invaders. Abdul-Salam complained that the coalition has tried to introduce new conditions to the December Stockholm agreement, which supposedly included a ceasefire in Hodeidah. Britain sending aid does not change the tragic reality of its arms sales. Jeremy Hunt cannot promote peace while at the same time acting as an arms salesman. Mr Hunt has gone beyond defending British arms sales, by attempting to pressure other European countries, such as Germany, to sell arms. If it wasn’t for the joint British, US, Saudi, and UAE naval forces, the existing famine and the tragic humanitarian situation wouldn’t reach such critical levels, including as he admits about 24 million Yemeni need an emergency aid of food and medicine. The Saudi-led coalition, backed by Britain, commits war crimes and does not abide by, as Britain claims, ‘the most stringent guidelines for the export of weapons in the world’. The principles mentioned are solely for political speech and to avoid the legal and moral responsibility concerning the war crimes and humanitarian situation that the British government faces as part of such alliance. Obviously Britain and France have pressured Germany to “relax” its arms sales “ban” on Saudi Arabia since November. Germany hasn’t banned previously approved deals but has “urged industry” to refrain from such shipments for now (is that a “ban”?!?). Britain needs parts from Germany to sell 48 Eurofighter jets to Saudi Arabia. Sunday the German ban would end unless an extension was agreed, which resulted in a renewed “ban” with a loophole that German defence firms can continue to supply arms to UK and France for the rest of 2019. A half-complete bilateral German contract for 35 patrol boats will probably also go ahead. The US House of Representatives has voted 247-175 to end US support for the coalition and direct US military involvement in the war against Yemen within 30 days. Hundreds of thousands have already been killed in the genocide which the United Nations, while cynically supporting the coalition, has called the world’s worst humanitarian crisis. This is the first time both chambers of congress have invoked the 1973 War Powers Resolution to stop support for a foreign war. The U.N. envoy for Yemen announced Monday that the government and Houthi rebels have reached agreement on the military plan for the initial redeployment of forces from the key port of Hodeida.Martin Griffiths told the Security Council by video link from Amman that "when — and I hope it is when and not if — these redeployments happen they will be the first voluntary withdrawals of forces in this long conflict." Griffiths called Hodeida, whose port handles about 70 percent of Yemen's commercial and humanitarian imports, "a test of many things," including leadership, and he expressed hope "that we shall see in the coming days the people's trust vindicated in this." Griffiths told the Security Council he was grateful to Yemen's President Abed Rabbo Mansour Hadi, who has repeatedly told him he wants "to see these redeployments happen," and to Houthi leader Abdul Malik at Houthi, who reconfirmed his support for the Hodeida agreement when they met in the capital, Sanaa, last week. "We will now move with all speed towards resolving the final outstanding issues related to phase two and the status of local security forces," Griffiths said. that the Sudanese forces involved in the Saudi-led anti-Yemeni alliance "will remain until the coalition reaches its objectives." Yesterday Donald Trump used the second veto of his presidency against the resolution to stop US support for the war, genocide against Yemen. This resolution is an unnecessary, dangerous attempt to weaken my constitutional authorities, endangering the lives of American citizens and brave service members, both today and in the future. Trump claims that the US is “not engaged in hostilities in or affecting Yemen” except “counterterrorism operations against [Al-Qaeda] in the Arabian Peninsula and ISIS”. Nor are any US military personnel “commanding, participating in, or accompanying” forces of the coalition operating in Yemen. If so why would he block it as Al Qaeda is exempted?!? Trump claims that the US only provides “limited support” to the coalition, “including intelligence sharing, logistics support, and, until recently, in-flight refueling” . President Donald also pointed out that the resolution would hurt relations with foreign powers and "its efforts to curtail certain forms of military support would harm our bilateral relationships, negatively affect our ongoing efforts to prevent civilian casualties and prevent the spread of terrorist organizations such as al-Qa'ida in the Arabian Peninsula and ISIS, and embolden Iran's malign activities in Yemen". The people of Yemen desperately need humanitarian help, not more bombs. 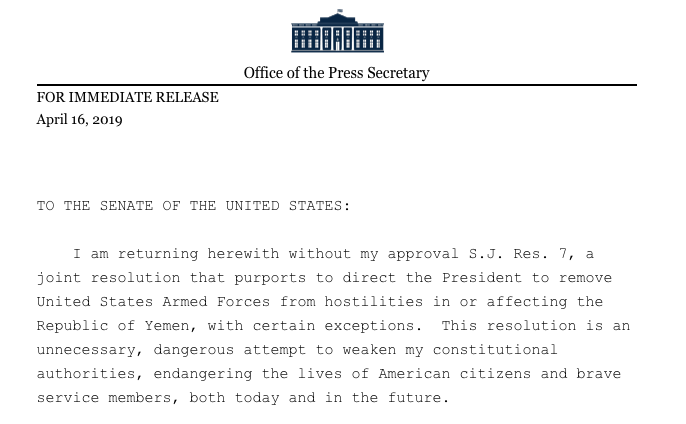 I am disappointed, but not surprised, that Trump has rejected the bi-partisan resolution to end U.S. involvement in the horrific war in Yemen. advance an enduring solution to end this crisis and save lives. The conflict in Yemen is a horrific humanitarian crisis that challenges the conscience of the entire world. Yet the President has cynically chosen to contravene a bipartisan, bicameral vote of the Congress and perpetuate America’s shameful involvement in this heartbreaking crisis. In January, French Armed Forces Minister Francoise Parly said that she was “not aware that any (French) arms are being used in this conflict”. This wasn’t the only time the French government has denied that they sell arms that are used in the war against Yemen. 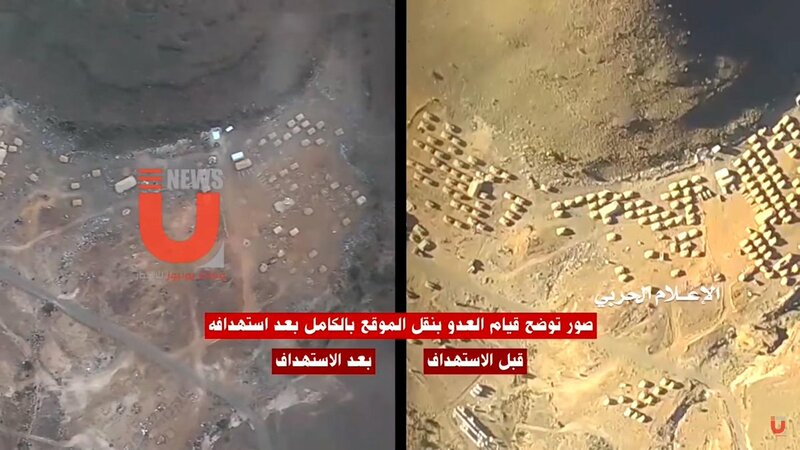 A classified document from French military intelligence service (DRM) shows that Saudi Arabia and the United Arab Emirate (UAE) are massively using French-made weaponry against Yemen. France, the third-biggest arms exporter in the world, has sold the following arms to to both Saudi Arabia and the UAE that are used against Yemen. In October 2018, 48 CAESAR artillery guns were used along the Saudi-Yemen border. French DAMOCLES missile-guiding technology has probably been deployed in Yemen. Two French ships are serving in the crippling blockade of Yemeni ports which has led to unprecedented starvation.